So, on this idea of working all of the media I ever have, exploring reaching new peaks, etc. I also understand how we have caves. These are places we are afraid of. 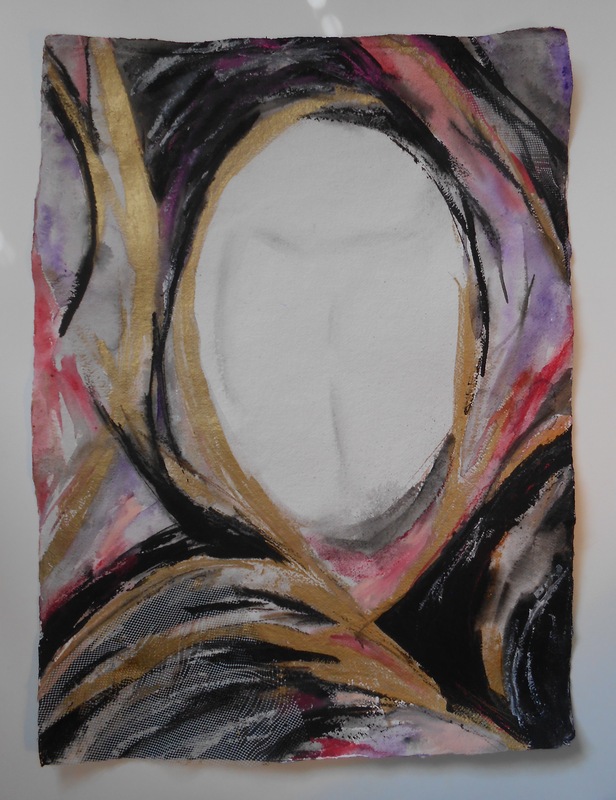 The “Mind Canyons” show what I know, what I have become, where I am as an artist. And, I am sticking my tongue out here, too!! I am on the rim, not in the bottom of that canyon. There are those that will also need to be ascended, but maybe they are a safe place to be. Might need a Topo there, too. Once upon a time, I thought that the art “season” in this part of the country began on Memorial Day week-end, and ran through Columbus Day. As the art community up here “unearths” itself, I am finding more and more opportunities to show throughout the year. 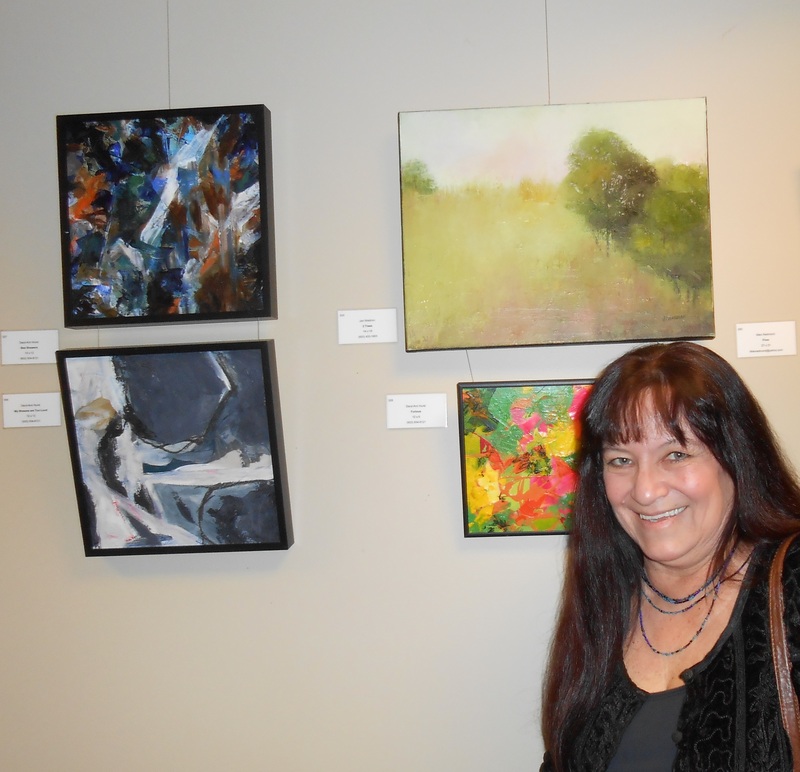 The year kicked off with finding out at the end of December, 2013, that I was accepted into the present show at the Gallery at 100 Market Street in Portsmouth. Only three of these are mine: Star Showers, My Dreams Are Too Loud, Furious. The happy little tree above my head is not my work. This show occupies 4 floors of a prestigious office building in downtown Portsmouth that hosts 4-5 juried group exhibits annually. 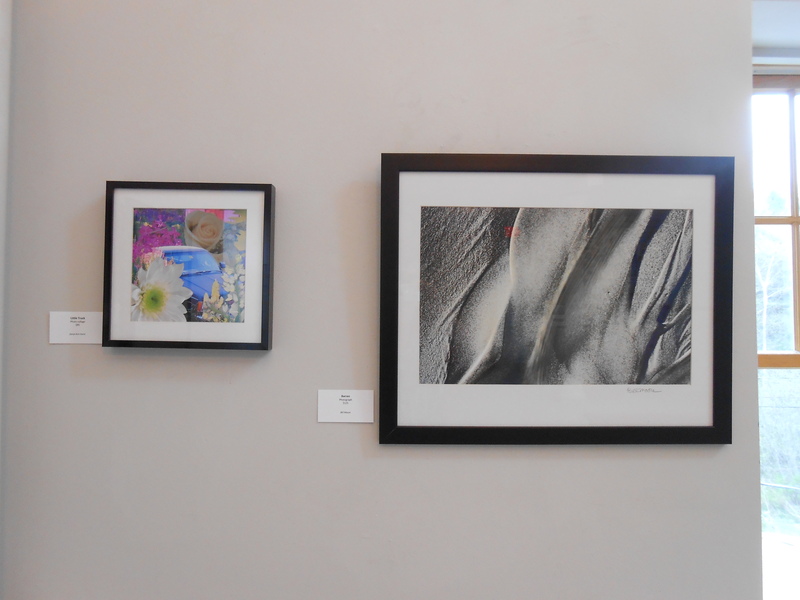 I am one of 30 in this show, and I have a total of five pieces here. These three are on the 3rd floor, 2 are on the 1st. This show will hang until the 12th of April. 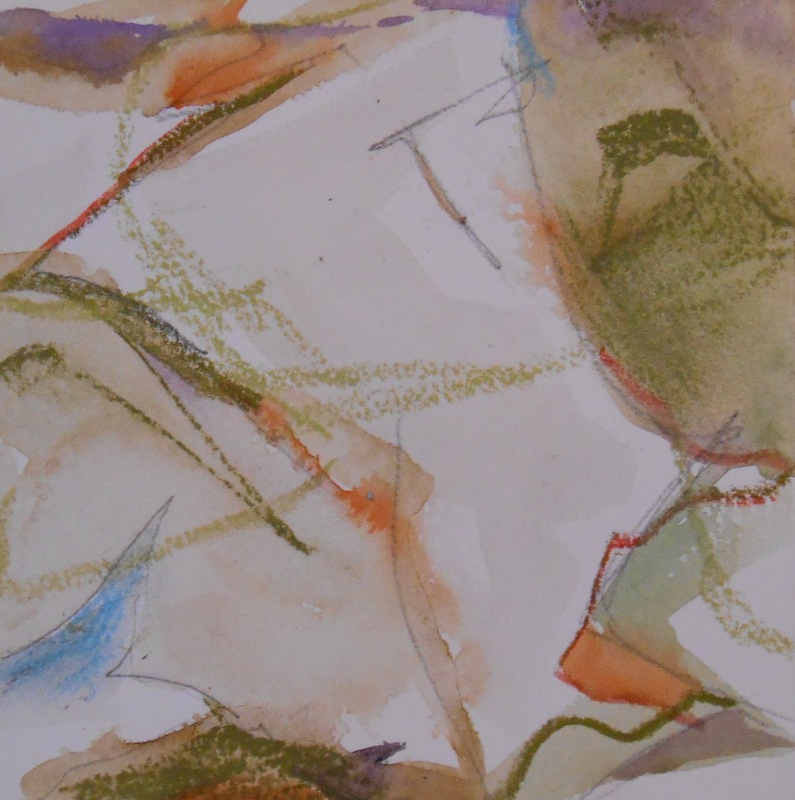 Last week-end was all art for me, and I painted very little-though I did-stay tuned for the next post!! 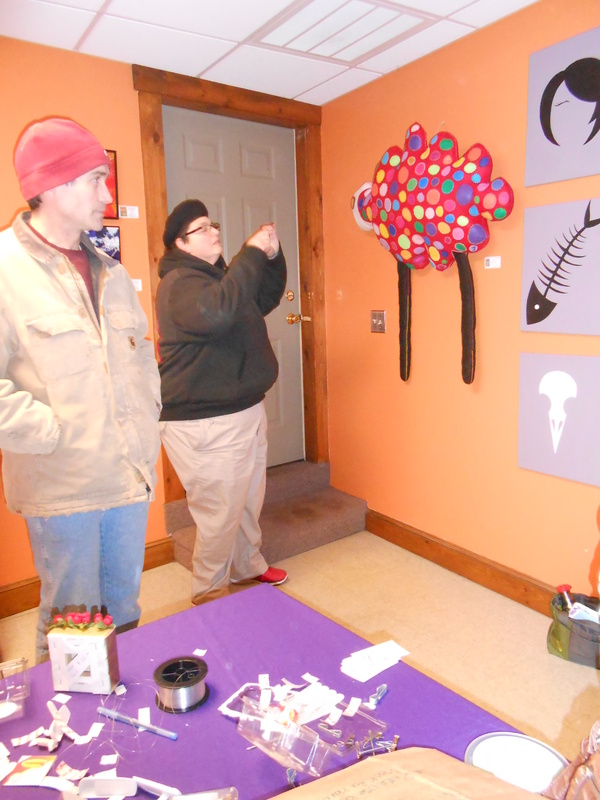 I was part of a BAA pop-up event at Dahlia on Saturday, and “The Sky’s the Limit” show opening reception was on Sunday . The Dahlia pop-up in North Berwick was staged in the a smaller room behind the larger store space. Kerry, the shop’s owner, fully intends on using the space we filled as more retail space but turned it over to us for the day. 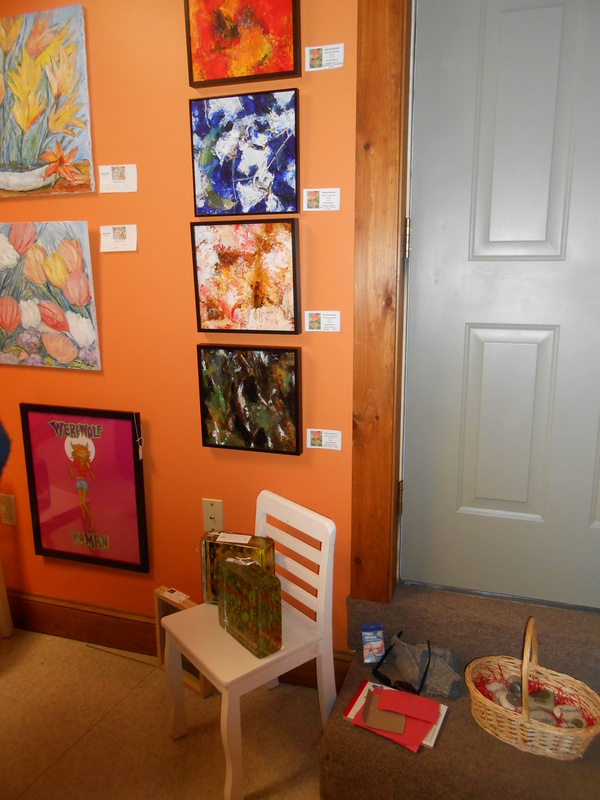 And, what fun we had hanging the show the Wednesday before as well as hanging out (and selling) on Saturday. When I started this blog nearly two years ago, I was returning to really familiar art terms from an earlier time. I have been to so many places in my work that I guess I will continue to recapitulate in some manner that is familiar now and for the rest of my career. 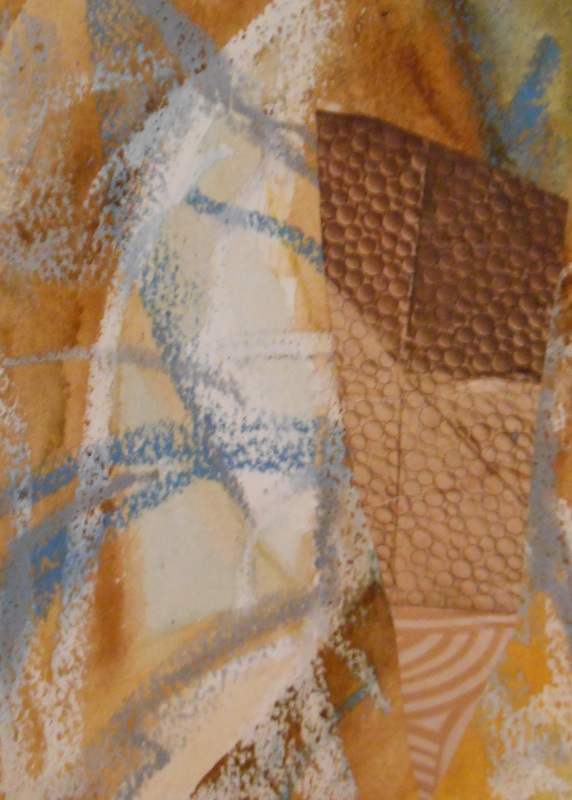 I am now pushing out boundaries in the sense that I never included photography in the 1980s mixed medium pieces. But, who had access to digital at that point, and I might have but there was the price of film and printing. Yesterday, I went to one of my old favorite toy stores, Home Depot. I bought one vinyl floor tile and Japan drier, scooped up a few samples of vinyl tiles, and snagged two pieces of free wood. Since the work has much to do with structural decay, the texture and colors of the tiles made sense. I was also looking for textured surfaces that I can paint. For 89 cents, I get 12″ x 12″ that are all ready to go. As I continue to organize the KAA Moderns Group, I am also getting myself set for these shows. The month of May has been somewhat of a blur, and I failed to post this earlier. What?! The show comes down Friday afternoon, and I will be at the library from 2:45ish-4:00, if you would like to ask me any questions. Some of this work will move to the Gatehouse Gallery in Tamworth, NH and some will be held in reserve for either a show at the Rice Library in Kittery, Maine or one of two upcoming group shows. Peggy Trout at the Rochester Library extended another invitation and I will be doing a 4th show next May there. 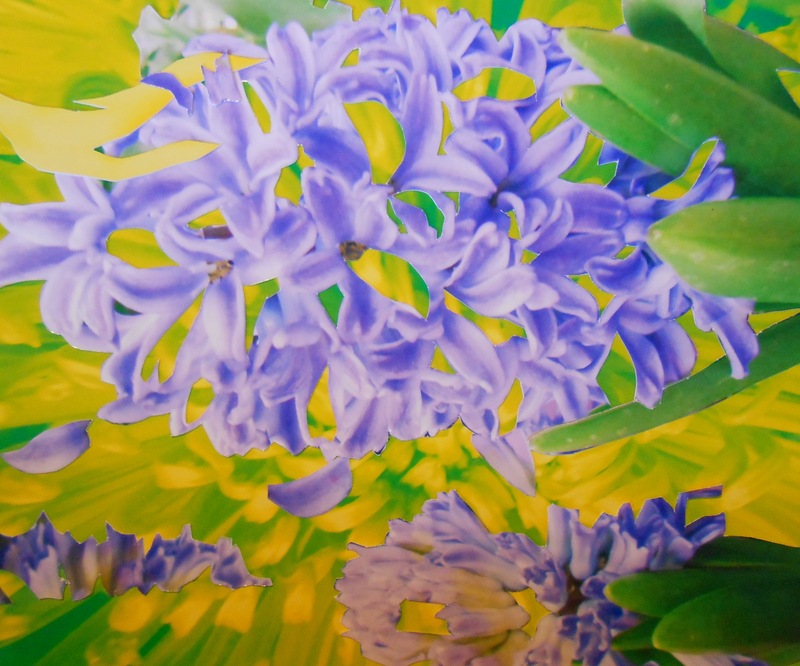 “Dancing Lilacs”, 2013. 10″ x 10″, framed and matted. Photo collage. “Rural Transportation”, 2013. 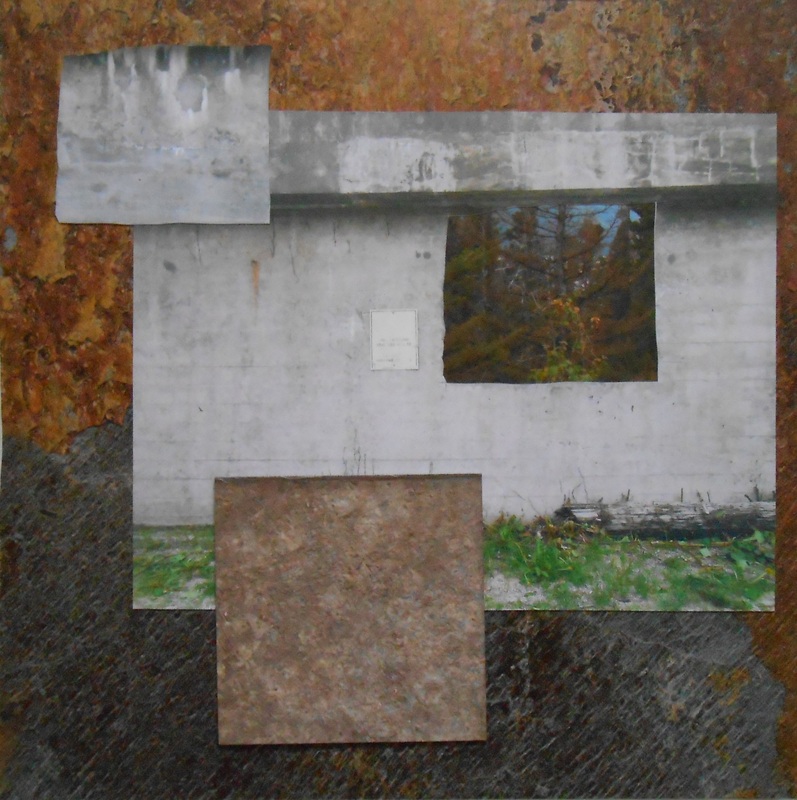 Photo collage, 5 1/2″ x 6″. 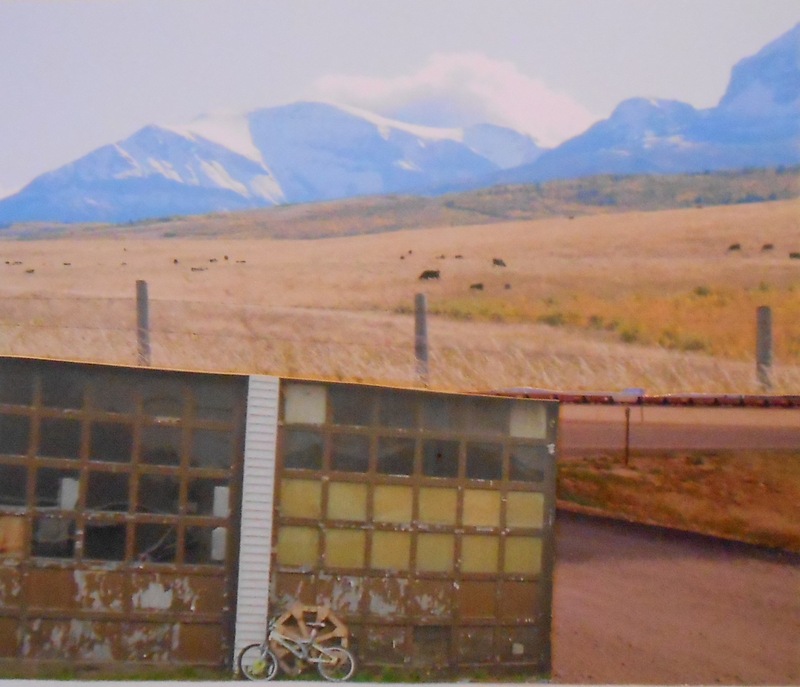 Planes (or plains), trains and …bikes. I am starting to clean up scrap from earlier this year, and I have always liked this bike shot in Aroostook County, Maine. The train comes from Shelby, Montana. The rest is from Alberta, Canada. 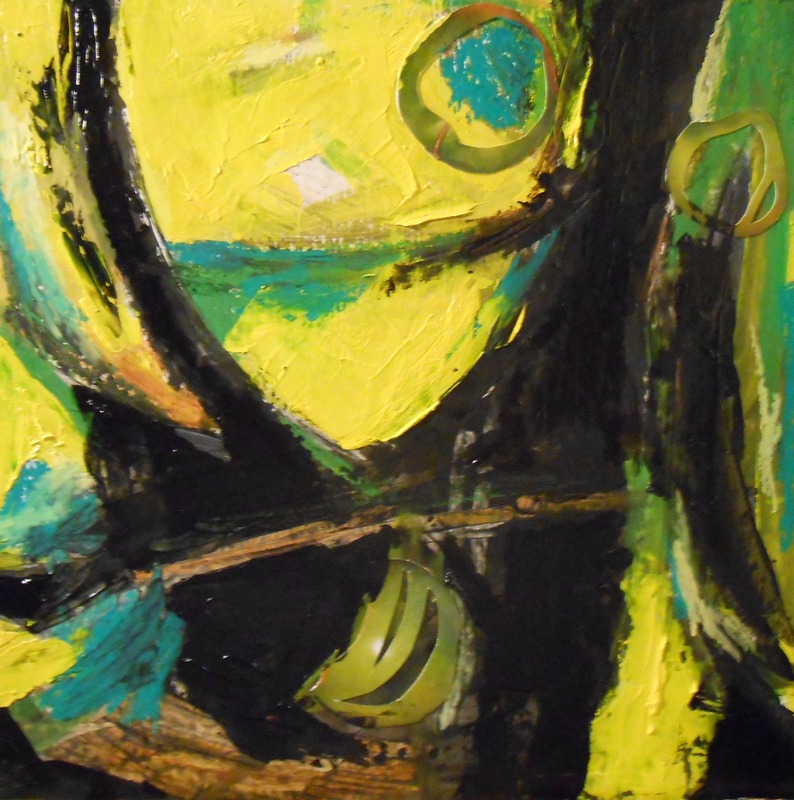 “Saturday Night Special”, 2013. Mixed media. 6″ x 6″, unmatted. Since the show closes tomorrow, I will keep this brief and simple! This was an open “themed” show, though an adherence to the theme, on a strict level, is not “enforced”. We also had area floral designers who matched their designs to chosen pieces. “Little Blue Truck”, 2013, photo collage. 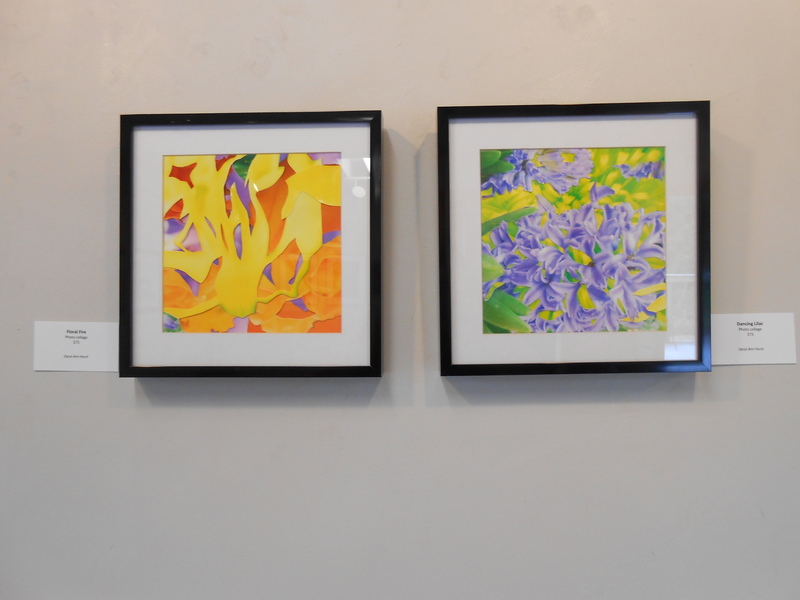 10″x 10″, matted and framed (on left). “Unravel 2″, 2013. 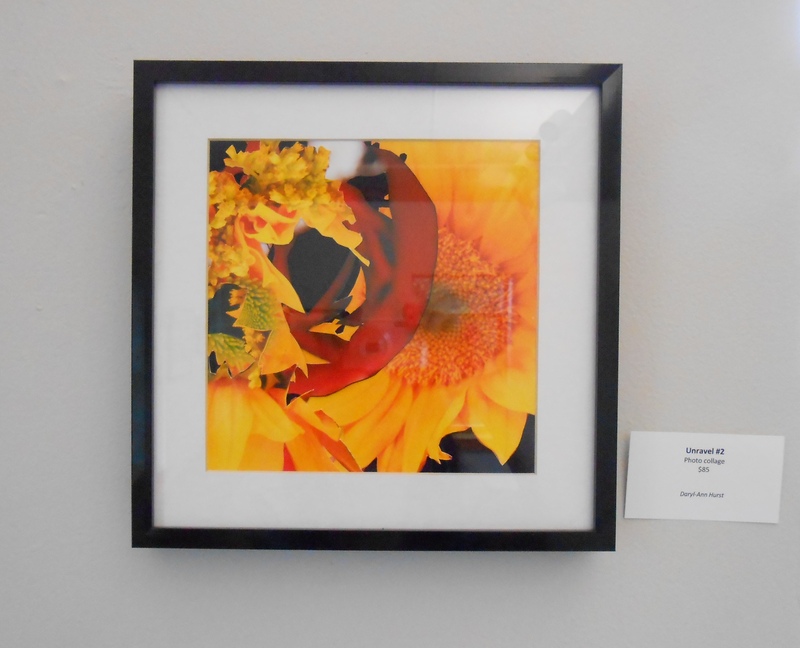 Photo collage, 10″ x 10”, framed and matted. Since I returned to blogging, I have not really explained why I am doing what I am doing. I regard myself as a painter, though I have done professional photography, so none of this is really off-topic. It was very much a decision based on finances that pushed me into exploring other methods of making art. Since I have old prints, I started cutting them up and manipulating them into other images. Recently, I got a nice chunk of overtime, and made more prints. The new series has really split into two very separate entities. 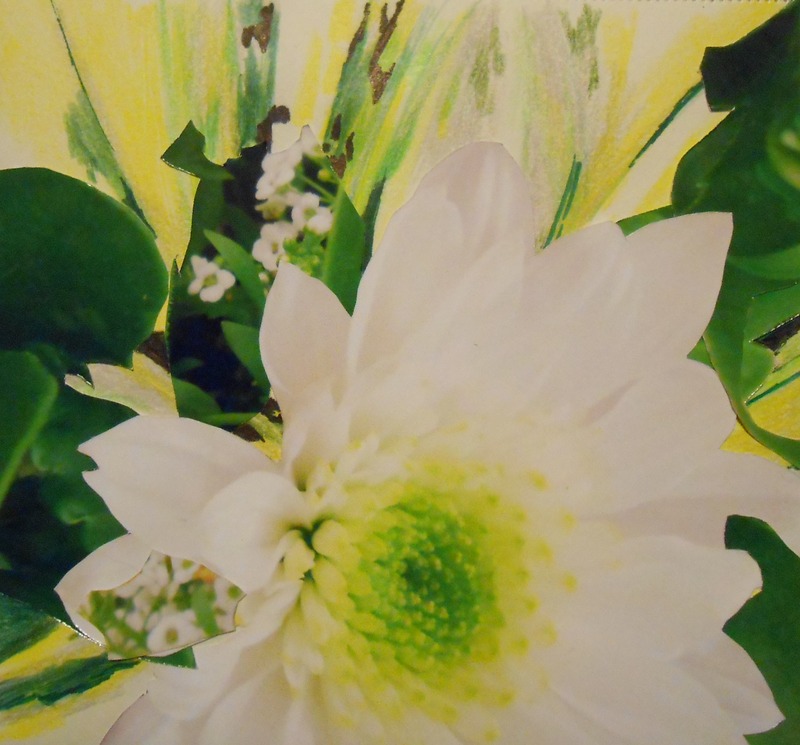 I am aware of that and I will continue to explore the floral based pieces as part of the “Razing the Garden” series, and the other pieces, which have nothing to do with flowers as “Rural Contracts”. The two have a very different attitude, but are providing a wonderful way for me to explore mediums and themes. I am about to start a painting-based “…Garden” piece, but I wanted to put this older “Rural Contracts” one up for viewing. It is called “Disposable Indian”, and is presently on display at the Gatehouse Gallery, in Tamworth, New Hampshire. There is no “hand” work in this besides the cutting up of three photographs from three different locations, and melding them into one image. Painfully honest, and maybe a bit dogmatic, but I still really like this image. This and three others are at the Gatehouse now.